Megamix - Megamixes combine the chaos of randomization with intelligent transitioning to create a unique mix of patterns every time. Color and Speed Control - Customize the color and speed of any mode. Double the Favorites - Store up to 30 customized favorites! Double the POVs - Original 15 Evoke POVs + 15 all new ones. More Rainbow - More stunning rainbow color schemes. Comets - Orbit your body with comets. More random pattern generators - 5 Random modes create a new pattern every time. Improved battery management - New intelligent power regulation for longer battery life. New LED tech - New advanced LEDs with improved color rendering and unbeatable durability. (A) Silicone Grip for consistent contact flow. (B) Polycarbonate Tubing - Impact resistant polycarbonate. (C) Battery Packs - Two battery packs focus the weight at the ends. (D) Microprocessor Board - Custom developed Atomic board. (E) 3D Printed Retainers - Custom retaining ends. (F) High Resolution LED Ends - LEDs from tip to tip. (G) Custom Silicone End Caps - Molded silicone end caps not only look awesome, they absorb impact and protect the circuit from dirt and moisture. (H) Carbon Fiber Core - Excellent rigidity while keeping the weight light in the middle. (I) Spiral LED Circuit - Durable LED wrap with three straight rows of LEDs. (J) Rubber Spacer - Absorb impacts, protecting the LED circuit. Our advanced LED circuit with around 300 full color LEDs capable of 16 million colors. LED strips run the full length of the staff. Long lasting 2000 mAh batteries. 1.5 to 3 hours of battery life on a full charge. All of the Atomic V modes and features, optimized for the staff. Scan feature loops though the modes of your choice. Brightness control to manage intensity and battery life. Preset menu to store up to 15 of your favorite modes. Weight distributed heavier at ends for great spinning momentum. High clarity silicone sleeve for awesome contact grip. Upgradeable for future software updates and advancements. Smart charger fully charges in 2-3 hours. Workmanship and durability guaranteed with a One Year Warranty. Atomic Designer - Create and share your own modes! 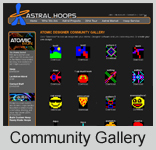 As a member of the creative hoop community, you're now empowered to use your artistic talent to take control over your Atomic modes. No longer will you have just the same standard (yet beautiful) modes as every other Atomic owner. Your Atomic can now be as unique as you are. Design modes with your favorite colors, patterns, and effects, then share them easily in the Community Gallery. Also, download from over 1000 modes other community members have shared in the gallery. You can even modify and build off of modes created by others. Astral Care is insurance that protects your Astral product from the unexpected. It covers any damage not covered by the warranty such as damage from water exposure and tubing breaks. Whether your Astral was left out in the rain, destroyed in a car accident, broken by a drunk guy at the club, or smashed by a jealous boyfriend, Astral Care has you covered. It doesn't matter how badly it's damaged or how it happened, we'll fix or replace it for free. Due to international package size restrictions, we are only shipping staffs to the US and Canada. Notice: We've been receiving a high volume or custom orders due to the Holidays. Please allow 2 to 3 weeks for us to handcraft your staff.